Susan L. Beningson joined us as Assistant Curator, Asian Art in 2013. Prior to her arrival, she taught Asian art history at the City University of New York, Rutgers University, and Columbia University. Previously, she worked at Princeton University Art Museum where she co-organized the exhibition Recarving China’s Past: Art, Archaeology, and Architecture of the “Wu Family Shrines” (2005). 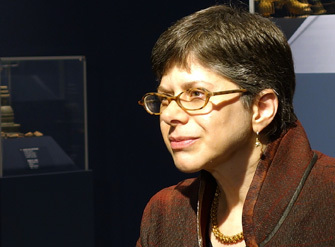 She co-curated the exhibition Providing for the Afterlife: “Brilliant Artifacts” from Shandong (2005), a loan show at the China Institute in New York of recent archaeological discoveries, organized in conjunction with the Shandong Provincial Museum in China. She has contributed to catalogues for the exhibitions Pilgrimage and Buddhist Art (2010), Buddhist Sculpture from China: Selections from the Xi’an Beilin Museum (2007), among other publications. Beningson received her Ph.D. in Art History from Columbia University in 2009. Her dissertation focused on Buddhist cave temples along the ancient Silk Road at Dunhuang, located in northwest China.